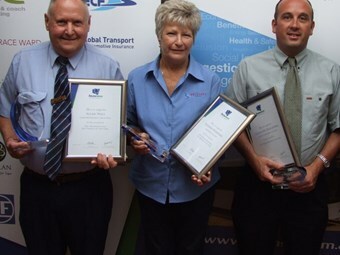 New South Wales’ best bus drivers were honoured by BusNSW at an award ceremony on Wednesday, with the winners across three categories representing both metro and regional operators. "The BusNSW Bus and Coach Driver of the Year Awards were established to recognise three individuals for their outstanding contribution to the NSW Bus and Coach Industry on an annual basis," BusNSW Executive Director Darryl Mellish says. "The Awards are divided into three categories - the Metropolitan and Outer-Metropolitan Bus Driver of the year, Regional and Rural Bus Driver of the year, and Coach Driver of the year," he says. "It is important to recognise the best drivers in our industry – those who exhibit a positive and cooperative attitude towards their passengers and always drive safely." Mellish says it had been a lengthy search to find the state’s best bus drivers for 2011. BusNSW Manager for Industry Development Matt Threlkeld says the awards were apt in the context of the NSW Government’s new approach to customer service. "With a new focus on customer experience it is a good opportunity to give the industry’s frontline staff some recognition for what they do on a daily basis" Threlkeld says. Tony Braxton-Smith, Transport for NSW’s Customer Experience Division Deputy Director General along with sponsor representatives James Barwick (Mobitec) and Markus Helgegren (Thoreb) were on hand to assist with the presentation of trophies and certificates to the winners. The Metropolitan Bus Driver of the Year award was won by ComfortDelgro Cabcharge driver Allan Wall, based on his 23 years of exceptional service to the company. With an outstanding track record, CDC management consider Wall an asset and joke they would clone him if the technology was available. The Regional and Rural Bus Driver of the Year award went to Tamworth Buslines driver Rhonda Humphrys who has worked with the operator for 33 years, starting as school bus driver and now in the town service roster – while maintaining morning and afternoon school shifts. NSW Coach Driver of the Year went to Green’s Northern Coaches driver Glenn Van Buggenum, considered a superb ambassador for the coach company. "We thank all the passengers and bus operators who participated in the nomination process, and of course our sponsor Mobitec/Thoreb for supporting the awards," Mellish says.